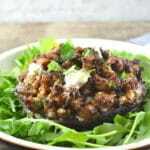 Incredibly delicious Italian Sausage Stuffed Mushrooms with Gorgonzola and Walnuts. A speedy supper ready in no time! Preheat the oven to 180°Remove the sausages from their casings and brown in a frying pan then add to a large bowl leaving as much oil in the pan as possible. Finely chop the red onion, garlic and parsley. Add the onion to the frying pan and saute until soft but not brown (add a tbsp of olive oil if needeadd the garlic and fry for another minute. Once cooked add to the bowl with the sausage. Add the parmesan,parsley, gorgonzola and pepper. Mix everything together until thoroughly combined. Lightly rub the outside of the mushrooms with a little olive oil. Stuff the mushrooms with equal amounts of sausage mixture. Bake in the oven for 15-20 minutes. Garnish with a little extra parsley and a couple cubes of Gorgonzola if desired. Italian sausages are normally quite salty so no additional salt was need in this recipe although you may need to according to what sausages you use.